The fourth annual Connecticut State Grange Let's Celebrate Day will be held June 12 at Cheshire Grange Hall, 44 Wallingford Rd. (one block east of the Town Hall), Cheshire. The Hall will open at 10:00 AM for viewing entries. Admission to this family-fun event is free, and parking is free. 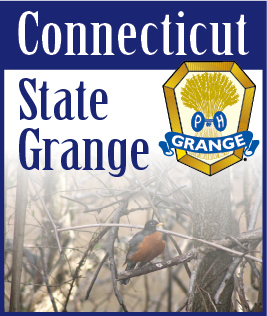 For 2011, two events - Let's Celebrate Day and Grange Sunday - have been combined into one as the Connecticut State Grange concludes it's year-long 125th Anniversary Celebration. The event will feature contests and displays including needlework, baking and crafts, photo and publicity, in both the adult and junior categories. There will be many activities for the whole family to enjoy. The day will begin with a non-denomination service at 11:00 AM by Connecticut State Grange Chaplain Amy Whitcomb, followed by a Lasagna Lunch by the Connecticut State Grange Youth and Family Activities Committees, and then an afternoon of fun. A program by the Connecticut State Grange Lecturer Marge Bernhardt will feature the Talent and “A Number” competitions which will begin at 1:00 PM. Tickets for the luncheon will be available at the door. Contest entries will be received on Saturday, June 11, 2011 at Cheshire Grange Hall by 10:00 AM and judging will begin at 1:00 PM. The many departments and committees of the Connecticut State Grange have been working together for over a year to ensure this event is a success. More information and complete contest rules are available by contacting the Connecticut State Grange Central Office at 860-633-7550, and by visiting the Connecticut State Grange website at www.CTStateGrange.org.